Dr. Nishida received his Ph.D. (1988) and M.S. degrees in Electrical and Computer engineering and B.S. degree in Engineering physics at the University of Illinois at Urbana-Champaign. With colleagues and students, he has published over 130 refereed journal and conference papers and received three best paper awards. He also received the 2003 College of Engineering Teacher of the Year award. He holds six U.S. patents. He is a distinguished lecturer for the IEEE Electron Devices Society and a senior member of IEEE. 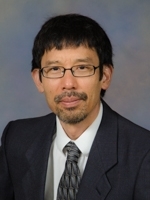 Dr. Nishida’s research interests include the development of reliable, high performance, multi-functional semiconductor devices and solid-state physical sensors and actuators for microsystems employing strained Si, SiGe, GaN, ferroelectrics, and polymers. Applications include biomedical, energy harvesting, logic, and micro-electro-mechanical systems.